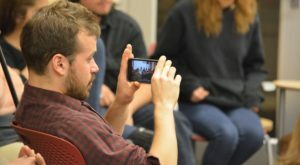 On March 9th, preservice teachers, professors, researchers, parents, and friends all packed into a presentation room inside the School of Education at the University of Colorado to watch the premier of the Olde Columbine High School English Language Arts class documentary on the KKK’s activity in Longmont, Colorado. A group of students there wanted to know more about the involvement of the KKK in their town history, in order to understand and challenge hate groups that are garnering startling publicity in the current political context of the US. The students launched an investigation as a part of one of our Compose Our World projects, titled, “What Happened Here?” The group of high school students watched on as their first audience took in the film they worked on for much of the last several months, a culminating experience of their Compose Our World project, engaging in practices associated with investigative journalism as well as documentary film production. The film, powerful and poignant, included clips from interviews with experts conducted by students. A museum curator, a historian/author, a high school history teacher, and a university professor all spoke candidly about the involvement of the KKK in our local history. One student’s voice, serious and knowledgeable, narrated throughout the film, weaving the interview segments with photographs and political cartoons depicting the KKK in Colorado. A somber tune played throughout, guiding the audience through the painful and serious nature of the content. While much of the film’s focus was historical, the narrator explained that there was a connection from the Klan to the current political state, citing a fear-inciting anti-immigration sentiment. The student explained that the Klan considered themselves to be a “political movement,” much like the “Alt-right” movement that garners much attention today. As the film moved from images from the past to today, black and white photographs of masses of people in white hoods faded into the background as color photographs of hate messages spray painted on walls began to take their place. “We also reflected on how racism impacts our own lives,” the narrator declared. And the film shifted to individual students centered in the shot, speaking straight to the camera about their experiences of racism. The camera shifts. Two students sit at a table, facing one another on screen, discussing how new students entered the class in the middle of the documentary production. 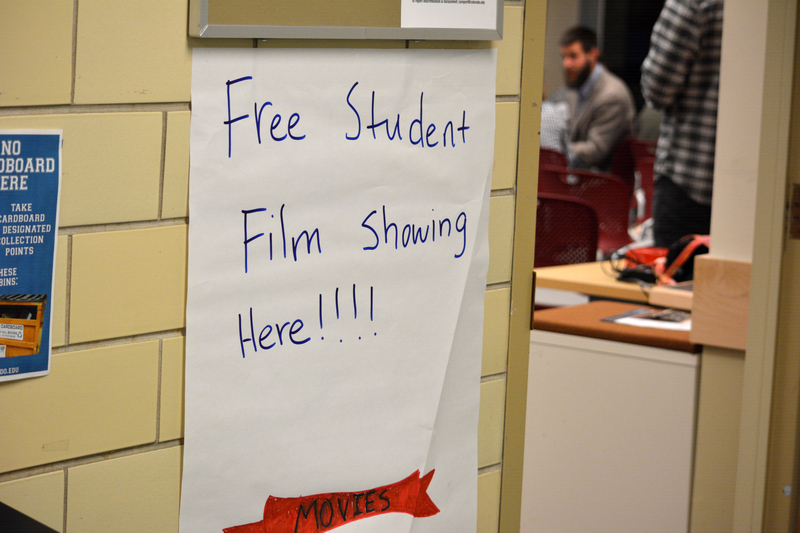 Instead of joining the last phases of film production, the students decided to launch an anti-discrimination campaign inspired by the film, with small groups focused on race, body image, gender, and ageism. Groups then discussed their processes, sharing how they developed public service announcements and went to middle school classrooms to share their anti-discrimination campaigns in workshops with younger students. High school students reflect about what it meant to them to be looked up to and listened to by the middle school students. “I feel like this project impacts my life because I’ve been discriminated against,” one student stated. After the film, the lights were brought up and chairs were shuffled to make room for the 20 student producers to face their audience for a panel-style talkback. When asked how this project-based learning course compared to other English classes the students had engaged in, multiple students spoke up. “It really helps me understand what’s really going on in the world,” another student added. The student producers shared how meaningful the learning experience of the “What Happened Here” project had been for them. They shared decisions that they made, personal mindsets that they expanded, and words of encouragement they were able to give to younger students. Having a live public audience to share their work and reflections with was clearly powerful, and the students expressed pride in their work and personal growth. The Compose Our World team is inspired by the students’ film and talkback. As we continue moving forward with revisions on the support materials for our PBL projects, it’s great to share a moment with students who benefit from this engaging, challenging, collaborative style of learning.